Plants are stakeholders in a subtle and complex chemical warfare to secure optimal growth conditions. Although it has been known for decades that plants produce and release chemical substances to fight their neighbors, it has remained unclear how exactly these compounds act on other plants. A team of German and French scientists has been able to show that one particular class of plant toxins slows down the development of competing plants by specifically acting on the structure of their genome. Plants are in a constant competition with their neighbors for limited resources such as light, nutrients and water. Only the fittest survive and reproduce. To defend their territory against invading competitors, plants employ so-called allelochemicals, toxic compounds that can inhibit growth and development of other plants. The existence of this chemical warfare, referred to as 'allelopathy', is widespread among many plant species, and has been known for a long time to scientists and agriculturists. Plants are able to release chemical compounds from their roots into the soil, where the substances decay or are modified by microbes. Some of these products are toxic when the roots of neighboring plants take them up. Work by Sascha Venturelli and colleagues now sheds light on the inner workings of this plant chemical warfare. Claude Becker, one of the leaders of the study, explains the importance of the findings: "The phenomenon has been known for years, and many classes of allelochemicals have been identified over the last decades, but for first time we now understand the molecular mechanism of such a 'territorial behaviour' of plants". 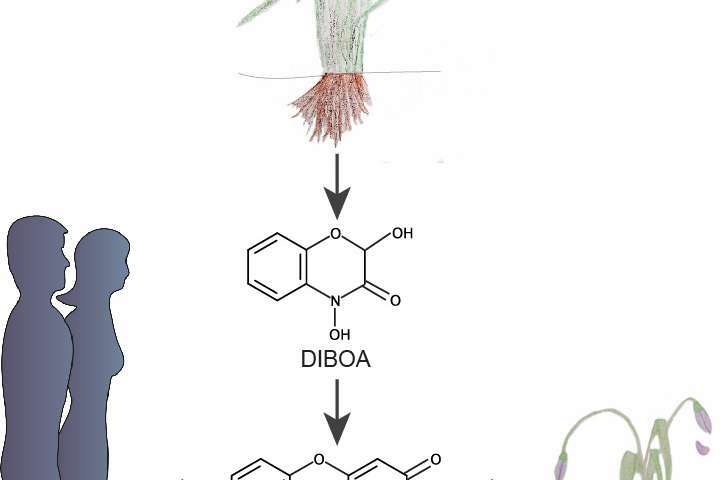 The scientists investigated the role a specific class of plant secondary metabolites, the cyclic hydroxamic acids DIBOA and DIMBOA. These are released by several grass species, and their degradation products are well known for their phytotoxicity. Through structural and biochemical analyses, followed by physiological experiments, Venturelli and colleagues could show that these compounds inhibit the activity of so-called histone deacetylases. These enzymes bind to histones, a group of proteins that together with DNA form the genetic material, also known as chromatin. Histone deacetylases remove acetyl side chains from these histones, causing compaction of the DNA and leading to a reduction in gene expression. In the model plant Arabidopsis thaliana, the scientists found that inhibition of histone deacetylases by the plant toxins lead to more histone acetylation and an increase in gene expression, ultimately causing plant growth to slow down. The study thus not only presents the first molecular mechanism for allelopathy, but also illustrates how environmental toxins can alter chromatin structure and gene expression. Allelochemicals are important regulators in natural and agricultural plant communities, and have repeatedly been associated with the success of invasive species in their new habitats. But there is more: "Herbal natural products in general hold great potential for the therapy of human diseases", says Sascha Venturelli from the University Clinics Tübingen, medical scientist and first author of the study, and continues: "We have found that these particular compounds efficiently inhibit the growth of human cancer cells, too." Indeed some inhibitors of histone deacetylases have already been approved as anti-cancer drugs. Michael Bitzer and Ulrich Lauer, initiators and co-advisors of the study explain on-going efforts: "Clinical trials at the University Clinics Tübingen currently assess the efficacy of these plant toxins in cancer patients." Understanding the mode of action of plant toxins could therefore also be of wider significance for medical research.